Georgia’s wineries are growing and thriving as their wines gain new respect. Wine Merchant: The Marietta Wine Market’s Randall Heard|! !| who sells some 55 Georgia wines in his shop. He also organizes winery tours. Here, in the pleasant 60-degree coolness of a “wine cave” set into the hillside, he shows off the high-tech instruments of his trade: enormous stainless steel tanks holding still-fragrant crushed grapes from the 13 acres of vines on the 197-acre property. (“I’d like to get that to 25,” Smith says.) A few delirious fruit flies flit about. Stacked nearby are the elegant French white oak barrels housing Yonah Mountain Vineyards’ cabernet and chardonnay. “We spend more on equipment than any other local vineyard I know,” says Smith, pointing out that the owners didn’t flinch when he chose the most expensive French oak for his barrels, at $1,500 each, for the unique qualities of flavor they impart to the wines. In only its sixth year, Yonah Mountain Winery is among the newest of Georgia’s 30-plus vintners. Its harvests have only recently begun to make their way into Yonah’s own bottles, decorated with a bear and a spiraled arrow within it. (Yonah is the Cherokee word for bear.) Smith, Yonah’s winemaker, began making wines from Georgia grapes in 2002 under the Serenity label, and still makes them in partnership with Yonah. Yonah’s owners, Bob and Jane Miller, hired him full-time in 2008. The Millers scouted the region with the help of University of Georgia and Napa Valley consultants and chose the location for its wine grape-friendliness, buying the White County property that had lain fallow for more than 40 years. Offsetting the winery owners’ significant investments, Smith says, is the winery’s rapid growth. The operation has grown steadily in its relatively brief business life, up more than 100 percent from last year and 197 percent from its first year. Success is not limited to European vinifera, but apparently extends across the board, to all kinds of wines made from native fruit. Figures from the Georgia Department of Economic Development support her case. According to UGA’s Center for Agribusiness and Economic Development, agricultural tourism in general had total sales of $80 million in 2007, with a total economic impact of $138 million. The number of wineries and vineyards in North Georgia has more than tripled since the mid-1990s. A 2005 study by UGA’s Carl Vinson Institute estimates that North Georgia wineries generated $1.16 million in 2005, and it expected that figure to double by 2015. Jobs are expected to jump 44 percent over the same time frame for the region. You only have to witness the crowd of cars at Habersham Winery’s tasting room in the center of a complex at Nacoochee Village or view the stunning vista from Wolf Mountain’s deck during its bustling Sunday jazz brunches to understand that the impact is likely larger. Overall, the patchwork quilt of wineries covering every region of the state generates income that translates not only to bottles of wine, but also to chartered buses, hotel stays, restaurant meals and myriad other points of interest, from Helen’s tourist havens to the old Sautee General Store and Mark of the Potter, known for its handcrafted earthenware. Though many still automatically associate Georgia wines with sweet native muscadines, Georgia’s varied climates support a number of different grapes and fruits, from European grapestock, or vinifera, planted in this country as early as Thomas Jefferson’s day, to south Georgia’s wild rabbiteye blueberries. All of them turn up in a dizzying array of wines, from the familiar sweet varieties to European varietals and blends to wholly unique products like Chesser Island’s dry sparkling blackberry wine, made with the traditional methode champagnoise. Georgia wine is made from almost every fruit imaginable, including apples and peaches, and even honey is used for mead. As in Jefferson’s day, Georgia winegrowers struggle to raise European grapes outside of the kind of exacting climate found in certain pockets of mountainous North Georgia. In fact, Three Sisters Winery’s Doug Paul points out that the growing climates for Dahlonega and Tiger Mountain, just 50-odd miles away, are different enough to hospitably host different kinds of grapes. His confidence was rewarded in January, when a panel of 10 wine experts, including The Atlanta Journal-Constitution wine columnist Gil Kulers and the St. Regis Hotel’s wine director, chose Yonah’s $36 Genesis blend over two well-known Napa wines, the Ghost Horse Cabernet Sauvignon and the best-selling retail restaurant wine, the $50 Jordan Cabernet, in a blind tasting. He went on to compare the Millers to another tireless, once-obscure wine promoter: Robert Mondavi, who had battled similar preconceptions about his California wines’ “inferiority” to French ones. A few miles away from the vineyards, in Yonah’s Sautee tasting room, Smith pours samples of Yonah’s wares, including a European-style dry rosé; chardonnay; Harmony Super-Tuscan blend of sangiovese, merlot and syrah grapes; cabernet sauvignon and his Genesis blend; and finally, a chocolate dessert wine made with Ghirardelli. Smith says that even among his walk-in customers, the winery’s few sweet muscadine wines are the slowest sellers. Another newer Georgia entry, Montaluce, has probably established itself as the most upscale and Euro-centric of all Georgia’s wineries, planning an entire 400-acre community of Italian-styled villas and “estates” that its website prices at $400,000 and up, around its winery and gourmet restaurant, Le Vigne (see review on page 92), overlooking acres of vineyards. The housing slump that struck almost immediately after Montaluce’s opening may account for the largely as-yet-unbuilt property, but the winery is going strong, recently winning honors at the International Eastern Wine Competition for its Dolce, Risata and Wildflower Mead wines. However, even when dotted with Montaluce’s upscale faux-Tuscan villas, the North Georgia mountains are anything but snooty, and that seems to have translated to the viticulture. Perhaps that’s the down-to-earth terroir (the French term for the wine’s literal taste of the soil and climate) of what North Georgia writer Candice Dyer has dubbed “Nappalachia.” For every tastebud there seems to be a palatable wine, and for the most part, winemakers embrace the state’s unique and varied wine-making qualities. “For heaven’s sake, whatever you do, don’t run a photo of a guy with a beard swirling wine in a glass,” fumes Doug Paul of Three Sisters Winery. “You don’t have to imitate Europeans to make good wine. True wine experts enjoy all kinds of wines – sweet, fruity, dry and everything in between.” Paul and his wife Sharon have also won many awards for their wines over the years, including Georgia Trend’s 2006 and 2007 wine competitions at the Ritz-Carlton for their ice-style dessert wine, Dahlonega Gold, and their Georgia Port. But he also proudly serves his Fat Boy Red with what he considers the ideal match: Cheetos. Unlike California’s Napa Valley, points out Kevin Langston of the Georgia Department of Economic Development, in Georgia “you can go and meet and talk to the winemakers. It’s a much more personal experience.” Many wineries also allow visitors to tour their winemaking operations. Some customers are delighted to simply learn Georgia boasts a wine country, like the Florida couple enjoying a tasting at the Yonah Mountain room. “We just happened on it, and it’s great,” says the wife, polishing off a taste of cabernet sauvignon. Some winemakers are beginning to enjoy new kinds of marketing, such as the groups that Living Social, an online “social buying” company with activities for targeted markets, brings to Three Sisters. Most of the wineries have Facebook pages and websites. 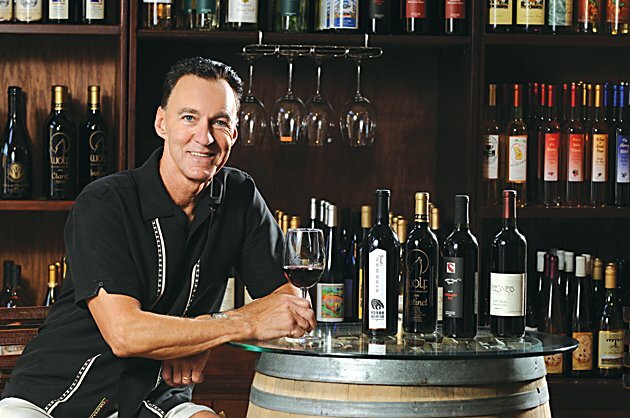 At the Marietta Wine Market, Randall Heard specializes in educating his clientele about wines from all over the world, but perhaps especially his home state’s wines. “We carry about 55 Georgia wines, more than anyone else I know of,” says Heard. He also organizes twice-a-year trips to wineries. A day’s excursion, including transportation to two or three wineries and brunch with a glass of wine, costs $85. Heard estimates that he sells between 200 and 250 cases of Georgia wine each year, with an annual increase. An upcoming vote on long-banned Sunday sales of alcohol is only one indication of a possible shift of attitude toward alcohol in Georgia – other recent changes to state and various county laws have already made things a bit easier for winemakers. Like most package and wine shops, Heard’s store stocks wines carried largely by big distributors. Some smaller wineries can stock their wares only where they can deliver them personally – which often means their own tasting rooms. However, until recently, wineries were not allowed to ship their wines to customers who called with orders – that has now changed to allow shipping to localities that permit it. She and the others carved out a list of six points they hoped to accomplish and scheduled a meeting with their local state senator, Jeff Mullis. The goals began with a simple but groundbreaking aim of putting all Georgia winemakers together as a whole, so the state can promote them. “It’s time for Georgia’s government folk to step up and help us promote the industry as a whole – regardless of region, size of operation or growing environment,” Doug Paul wrote in an email. The winemakers point out that their highly regulated businesses bear an extra excise tax, over and above sales taxes, along with byzantine laws governing how they are collected. Unlike other wine-making southern states like North Carolina, Virginia or even Florida and Texas, Georgia does not budget funds to help the local winemaking industry. A Georgia Wine Commission or Georgia Marketing Board, as proposed by Prouty and other winemakers, would entail a two-person office to help promote the state’s wines, paid for by winemakers’ excise taxes. The winemakers also say that authorization for special tastings for approved events would allow them to fulfill requests from groups and charities for fund raisers featuring wine tastings. Finally, an authorization allowing Georgia wines to be fortified simply means that state winemakers could make ports and other fortified wines (which require the addition of spirits) without taking them into another state to do so – a prohibitive cost. Prouty and Paul are optimistic about their initiatives.